Description: It is a cactus like plant having thick and fleshy leaves with spiny margins. Leaves contain a gel, which is bitter in taste. These are closely arranged near the plant base in whorls. Bright orange coloured tubular flowers appear in spikes during late winter on old plants. Care regime: It needs only occasional watering and can even thrive under moisture stress conditions. 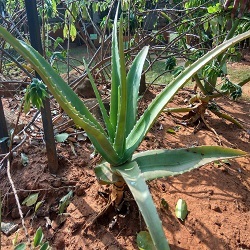 Excessive watering may result in decay of the plant. The plant likes direct sunlight. Collection: The plant becomes ready for yielding leaves from about three months after planting. Leaf collection can be started with the lower leaves that can be cut by a sharp knife from near the base.